maintains a minute’s silence to pay homage to all the known and unknown soldiers, whose bravery and sacrifice gave the world a peaceful sky to live under. 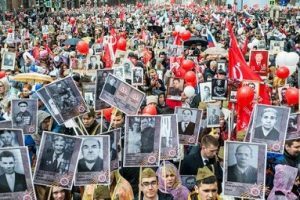 For the last four years, a march called, Immortal Regiment March, is organised in Moscow. The number of participants in this parade has been increasing every year. According to estimates, this year more than one million people participated in the procession. 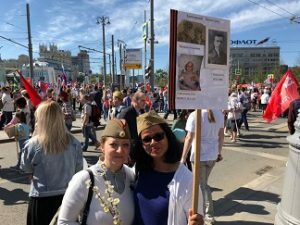 Moscowites come carrying placards with photos of their family members in this march. The number of participants and photos they hold can give but a rough estimate of the losses every Russian family underwent in the war. 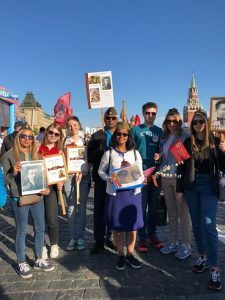 This year I also went for the Immortal Regiment March with two Russian families. My friends were carrying photos of their closest relatives lost during the war. We joined this procession from Belorusskaya Metro station and walked up to the Red Square, the endpoint. Walking in long strides with the Russians and people of all the former Soviet republics now living in Moscow, was indeed a unique experience. The whole crowd was singing songs of the Great Patriotic War. Lyrics of those soulful songs made me tearful, several times. In one of the songs, it says that this day is a joyful one though it brings tears to the eyes. The festivities and celebrations cannot wipe out sorrows and losses of the war years. 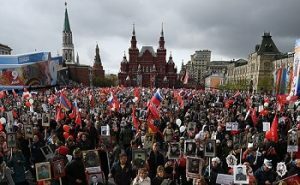 Though the distance covered by the procession was not much, strolling singing songs and crying out patriotic slogans took us around three hours to reach the Red Square. Upon arriving the Red Square, we clicked a few photos and headed towards the closest metro station Tretyakovskaya. Lena had invited all of us for dinner after the parade. She had cooked half the things before leaving for the march and the rest we all quickly prepared after we reached her home. Of course, by this time all of us were very tired and hungry. After we had settled down with the first round of food and drinks and all of us were feeling a bit relaxed, passionate toasts and tales of the war started pouring in. As I have mentioned in the beginning, there were two Russian families present at the table. My friend Lena, who was the host, is from Saint Petersburg, which was known as Leningrad in the Soviet time. Leningrad was under siege by Nazi soldiers for close to 900 days. Located in the north of Moscow and situated on river Neva, at the head of the Gulf of Finland on the Baltic Sea, the city becomes extremely cold during winters and temperature drops below minus 20-degree centigrade for several days. This war has had a very big impact on the people of Soviet Union, especially in the European parts, where the war had reached the doorsteps of ordinary citizens. In our first year of studies in Tbilisi, when we were undergoing Russian language course, we were taught about the Great Patriotic War in details. We had learnt that the siege had cut off the people of Leningrad from the rest of the country, and for almost three years they had to live on inadequately rationed food. Apart from the usual war hostilities, the cold and hunger too took their toll on the situation, and the people of the city kept dying and families losing their members. The other family at the table was from Moscow, and they also had many stories of courage and loss to share. Of course, the war had adverse effects on the whole country, but several of the cities were very severely affected. These cities, after the war ended, were honoured with Hero-city’s title for their outstanding heroism. There are 12 such cities, and Moscow was one of them. These tales are very precious and rare, as the older generation who had lived through the war years were not too keen on talking about those dark and haunting days. My friends have painstakingly gathered all available pieces of information and tied them into tales. Lena comes from a family of army officers. Her parents and grand parents served the Soviet army throughout their lives. Lena’s grandmother, Lyudmila Michaelovna Gerasimova, worked in the army hospitals from the age of 18. She started her job as a nurse in field hospitals during the Finland war of 1939. Later, during the World War II, she served in Hospital no. 2015 in Leningrad throughout the siege in the capacity of army personnel as a Lieutenant. In 1941, she gave birth to a girl, when her husband was serving somewhere near Leningrad. In January 1942, nobody could trace her husband, and he was enlisted ‘missing.’ Her daughter of 6 months died of cold and hunger in January 1942. The fate had more punishments in store for Lena’s grandmother. Her father, who because of poor vision was not allowed to go to the front, was at that time working in a factory. One day while returning home from work a bomb fell on him and he died on the spot. Some people saw this mishap and informed his wife about his demise. She had a weak heart and too passed away after two days of the incident, unable to bear the painful blow. It is beyond me to imagine the trauma that a 21-year-old girl had had to undergo in those dark days of January 1942. Within the space of 15-20 days, she had lost her parents, husband and the only child. Because of the siege, people at that time were buried in mass graves and till date, Lena’s family does not know where the final resting places of their close relatives are. Apart from these misfortunes, Lena’s grandmother lost her aunts and uncles too. She could live through those dark years thanks to her young age and her army hospital job. People working in war connected areas were given more rationed food than what the civilians received. The grandmother received 400 grams of bread, instead of 125 grams given to other civilians. For her services towards the country, she was awarded many medals and laurels. 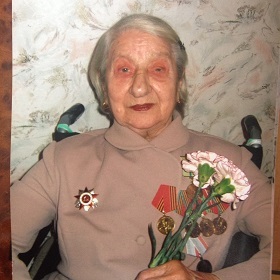 She was decorated with the Order of the Great Patriotic War, medal for the Liberation of Leningrad, Zhukov’s medal, Citizen of Leningrad during siege and many more. Now, these decorations are articles of pride for the family. There are stories that hunger was so bad in Leningrad that all dogs, cats and rats had begun to disappear. At times even people were found missing. The other family at the table was Anna’s. 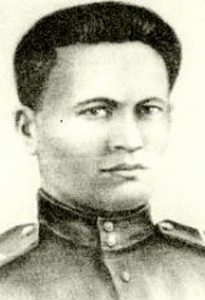 Anna’s grandfather, Vasily Pankov, was a Lance Sergeant in the Soviet army. At the time of his death he was 18 years old. He joined the army in January 1943 and died fighting the enemy in June 1944. In a battle near Dneiper in Belarus on 28 June 1944, he killed 11 German soldiers in direct combat. This heroic deed helped their regiment block an apartment building and capture 100 German soldiers barracked there. Later on the same day, he and his regiment fought several fierce battles on the street of the city of Mogilyov and killed around 60 enemy soldiers. He died fighting in one of those battles. For his bravery and heroism he was honoured with the highest award of the Soviet Union- Hero of the Soviet Union. 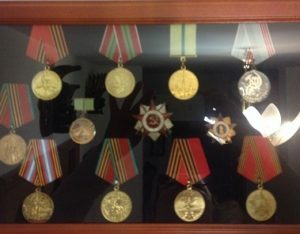 Anna says that though he served in the army for a very short period, his many awards decorate their house. He was honoured with the order of Lenin, the Order of Glory, and the Military Merit Medal. He was awarded all these medals posthumously. After joining the army Vasily had been injured three times seriously. And every time he would run away from the hospital to the front, before getting fully cured. Anna believes that he must have inherited this trait of being headstrong and fearless from his mother. In 1941, Vasily was visiting Odessa to spend his summer vacation with his cousins. The war started on the 22nd of June. The place he was staying was one of the first to go under German occupation. When his mother came to know about the occupation, without giving a second thought, she headed there to bring her son back. Her journey from home to her son was not an easy one. As she got closer to Odessa, things kept getting worse. She had to go through many check-points, change trains several time, and answer questions of the occupiers. But none of these could deter her from her mission of locating her son and taking him back home. Of course, this was just the beginning of the war in the USSR, and the things had not yet become very bad. 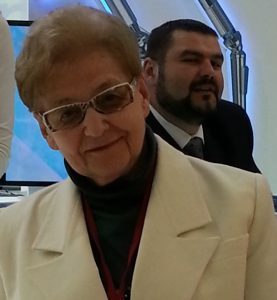 She succeeded in finding her son and both of them could leave the occupied territory and return home. After returning home, her son stayed with the family for a very short period. He joined the army and left for the front in January 1943 to die in June 1944. We continued talking about war days’ stories and many other things sitting at the table, when the sky and certain buildings started reflecting bright colours. The Victory Day fireworks had started at 10 in the evening. We went out to the balcony and enjoyed a tiny fraction of the spectacular fireworks displays organised at several points in Moscow. While enjoying the dazzling exhibition, I was thinking what the few remaining veterans of the war feel looking at this spectacular show. I feel along with the jubilant feeling of victory, they experience deep sorrow of great loss at such moments. These veterans don’t want the world to go through any more wars. Festivities of victory are celebrations of peace and peace alone.